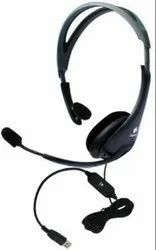 Our range of services include logitech headphones. The perfect everyday headset with a simple plug-and-play USB-A connection. A noise-canceling microphone reduces background noise and delivers clear digital audio for VOIP and Skype calls,The perfect business headset for voice calls, Skype, webinars and more. The 5.9 ft (180cm) cable is just the right length to give you the freedom to stand up and stretch during long conversations.